What in the world is “open joint siding? To protect against rain, snow, wind and more, Modern-Sheds can be built with rain-screen technology. Our open joint siding is more than just a pretty (sur)face. 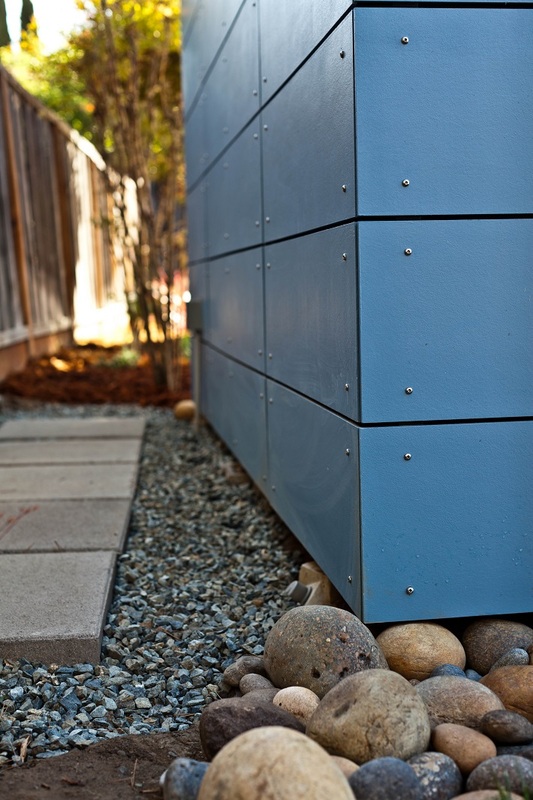 Natural forces impact how we design Modern-Sheds and select the materials we use. We need materials that protect from the elements, while also providing a modern aesthetic. However, form should follow function, but how? The result is simple, elegant and practical. To protect against rain, snow, wind and more, Modern-Sheds can be built with rain-screen technology. What is a rain screen? And why is it important to buildings and energy conservation? A rain screen simply protects or “screens” the structure from the dangers of the elements. A rain screen is an exterior cladding infrastructure that sits away from a building’s outside wall’s weather-resistant barrier, creating an air cavity directly behind the screen that helps to protect the building’s important weather-resistant barrier. This allows any moisture that may pass by the cladding to easily drain away from the building, and the air that flows between the cladding and the wall evaporates residual moisture, eliminating the chance of rot to the sheathing or the siding. 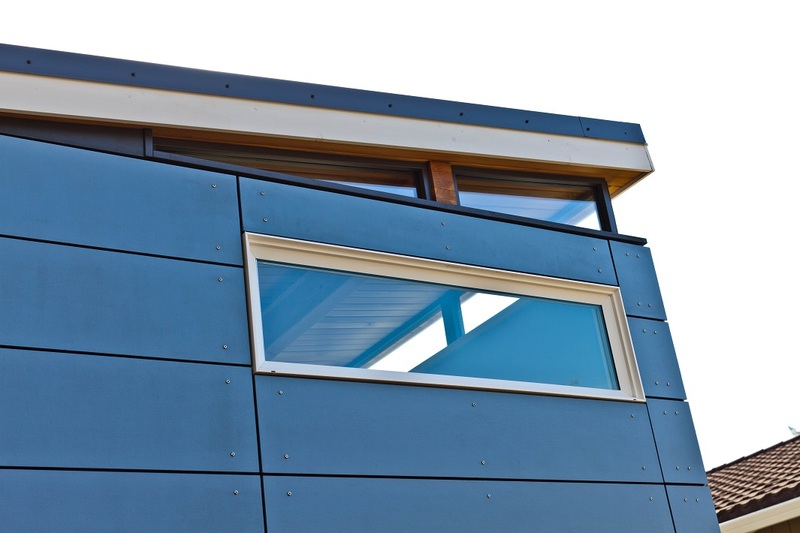 The actual siding panels can be viewed as a building envelope designed to limit the amount of water that could come into contact with the moisture barrier, reducing the chance of water finding a way into the wall assembly. It does this by defending the wall assembly against the five forces that drive rain into buildings: kinetic energy, gravity, capillary action, surface tension and pressure gradients. Our system employs 5 components which work together to keep a Modern-Shed dry, breathable and more energy-efficient than other more standard siding methods and for that matter other “rain screen” or “block design” siding. The sheathing (sheeting) covering the outside of our framing material is called ZipWall® and is an OSB sheathing impregnated with a green waterproof membrane. All seams are taped with a special tape to prevent leaking or seepage. But leaving the tape and green ZipWall® exposed wasn’t enough for us. So we wrap the entire structure in a fabric, (somewhat like Goretex®) which is waterproof, breathable and UV resistant. The seams also get taped with another special tape made by the manufacturer of the wrap. Furring strips are mounted to the exterior to create the air space necessary for the rain screen as described above. James Hardie® cement board siding panels (pre-painted at our factory on all sides) are attached to the furring strips with stainless steel screws, which won’t rust. The rain screen also helps conserve energy. With the air gap between the exterior siding panels and the structure, a solar heat barrier is created, making the system viable not only in wet climes but in sunny ones as well. We call it “open-joint” siding, and it offers the most breathable, energy-efficient option for Modern-Shed customers. The look has been copied by others, but beware, most do NOT actually create a true rain screen.